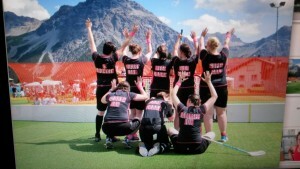 Ladies played a tournament in Arosa! This year our ladies team subscribed for a tournament in Arosa in Switzerland. This tournament was a small field tournament, also called Swiss style in Holland. Three players and a goalie playing together on the field. 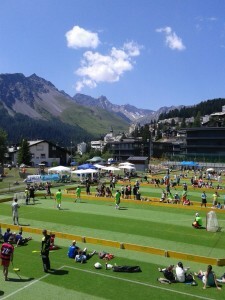 The best thing about Arosa is playing floorball outside and the amazing view! In the middle of the mountains, in the sun, in an amazing outfit we were able to play the sport we all love. In specially made shirts for this tournament, the team ‘twee woorden negen letters’ had an amazing performance. Saturday four games are played, of which we won three and one draw. During the matches we could relax and find some shay around the lakes. Playing in such nice weather outdoor is absolutely amazing. In the evening we went out for a beer or two. Enough clubs to enjoy the evening. Sunday morning we won another game. The result is that we became first in our poule. The second match on Sunday was really exciting. 16 penalties in total were necessary for us to win the match. Special thanks to Mirjam, being a terrific penalty goalie and Hanneke who made the winning goal. So right after the penalty wehad to play against team Granny’s. The temperature was hot, everyone was exhausted, but no time to relax. The game was really excited and both teams were fighting strong. Unfortunately team Granny’s scored in the last minute, so they won by 3-2. As a team we could be proud of our performance. We made it into the top 16! If we keep in mind that there are 96 woman’s teams it was really good. The bright side was, that we had enough time to use the cableway all the way up in the mountains. The bestview we have seen. Even from 2600 meters we could still see the floorball fields. This entire weekendwas absolutely amazing and Arosa we will see you next year!